The Big River Racing team has had some exciting races that the team has competed in. Across the board the team has had multiple great performances from both the men and the women sides of the team. 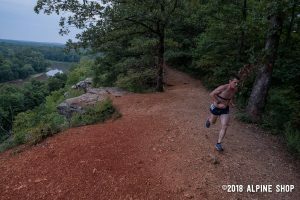 Starting on the Trails was the final race of the Alpine Shop Series in Castlewood State Park in Ballwin Missouri. Ben Hudson, the sole competitor for the team ripped through the woods and climbed the hills of the park to get second place for the race and sealing the overall win for the Trail Series with 54 points made up of two 1st place finishes worth 15 points and a 2nd place finish worth 12 points to go along with his 2nd place finish in the last race. The next weekend saw a change of weather and scenery from sunny skies and woods to pouring rain and fields was the Team’s Annual Cross Country Festival on the Boeing Aviation Fields in Forest Park. The rainy and muddy conditions were the scenery as runners from multiple teams as well individuals that trekked through the muddy course. Matt Mixdorf led the team winning the race followed by Chris Floyd taking 11th and Marcus Walton taking 12th. Following the open race was the beginning of the High School Races which are the main races of the day featuring over 1000 athletes from multiple areas of Missouri as well as the bordering states. The next day also saw some competition in Downtown St. Louis for the Cardinal Care 6k. 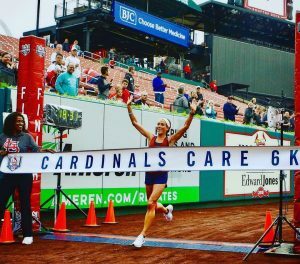 The Cardinal Care 6k which is done in order to support health and fitness for kids while also honoring the legendary Cardinals Player Stan Musial’s memory. The team went 1-2-3 as they ran through the many parts of the area finishing in Busch Stadium. Working together to secure 1 and 2 overall were Mark Spewak and Marcus Walton who raced the day before in the Cross Country Festival Open Race. For the women Julia Kohnen swept the women finishing 3rd overall and 1st for the women. 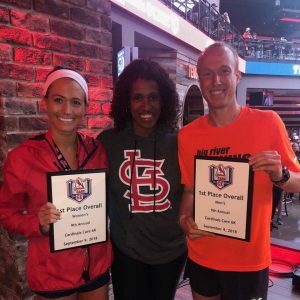 On the same day in Crown Point, Indiana was the Hub City Half. The team’s sole representative, Tricia Frisella, won the race. 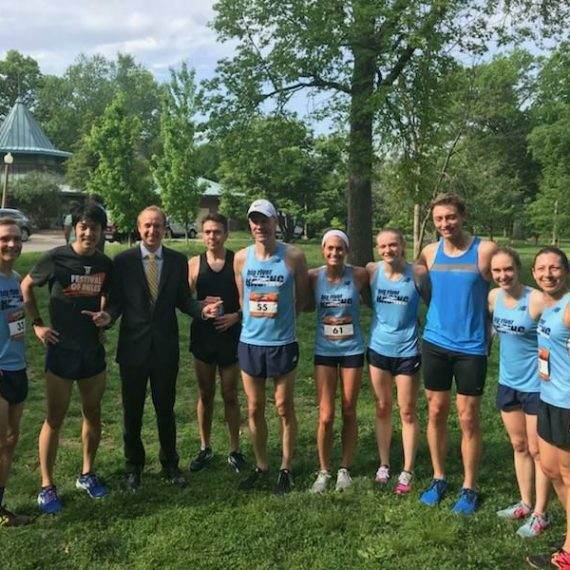 The following weekend was a big week for the team starting on Saturday with Matt Mixdorf winning Run for the Hills put on by the St. Louis Hills Neighborhood Association. Then on Sunday starting in Cape Gireadeau, MO Cass Dedert took 2nd in the City of Roses Half Marathon. 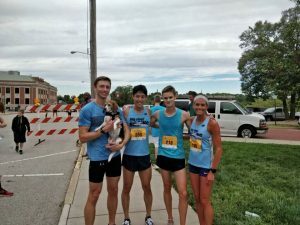 Then in Decatur, IL the team was also present for the Shoreline Classic featuring the 5k and 15k distances along the Decatur/highway shoreline. Tony Wang took 3rd overall in the race 2nd in the men. Mark Spewak was close behind taking 5th overall 4th in the men’s division. Then Julia Kohnen took 2nd in the women’s division 7th overall. Lots of great performances by the team in the weekend. That weekend also gave the team even more momentum as they head into the next weekend of September. The weekend started on Saturday with the Miles for Meso race in Alton, IL to benefit Mesothelioma research. For the men’s division, the team swept the podium the competition working together with Brice Pavey leading to take the win with Caleb Emberton and Tony Wang very close behind to get 2nd and 3rd respectively. Julia Kohnen won the women’s division with a fast time on her behalf as well. From IL to MO we then turn to the St. Jude 5k where one of the team’s masters competitors Bob Deak won the Masters’ Race. For the final week of September saw light but still very good races for the team where Ben Hudson won the Rockin Rockwoods 13 mile trail race and Caleb Emberton won the APA Fast and the Furriest 5k run. This September saw some exciting and good performances from the team overall. As the team goes into the fall, the team will be prepping and getting ready for a few goal races as well as cooler weather. Be on the lookout for the October Edition of the Big River Racing Monthly Wrap Up.